As part of the Notre Dame Initiative for Global Development (NDIGD), a group of collaborators at the University of Notre Dame has received a grant from the U.S. Department of State to train young African leaders in entrepreneurship. The collaborators include the University of Notre Dame’s Mendoza College of Business Nonprofit Executive Program, the Kellogg Institute for International Studies’ Ford Family Program in Human Development Studies and Solidarity and the University’s Engineering, Science, Technology and Entrepreneurship Excellence Masters (ESTEEM) program. The $100,000 grant was awarded through the State Department’s implementing partner, IREX. Additional funding and technical support for the training program has been provided by the IBM Corp. and The Coca-Cola Foundation. The grant will position Notre Dame to serve as a host institution for the Washington Fellowship for Young African Leaders program. This summer, the University will partner with IBM experts to provide 25 students from Africa with six weeks of training in the area of business and entrepreneurship. Courses will be designed by IBM instructors and Notre Dame faculty and staff for the aspiring entrepreneurs who hope to assume leadership roles or start their own business ventures in Africa. The Washington Fellowship for Young African Leaders is the new flagship program of President Barack Obama’s Young African Leaders Initiative (YALI). The initiative was launched in 2010 to support young African leaders as they spur growth and prosperity, strengthen democratic governance and enhance peace and security across Africa. Beginning this summer, the Washington Fellowship will bring 500 students to the United States each year for academic coursework and leadership training. The program is expected to create unique opportunities in Africa for fellows to use their new skills in leading organizations, communities and countries. The African fellows’ U.S. experience begins with a six-week academic course at one of several university campuses across the country. A three-day summit in Washington, D.C., will immediately follow the institute program, and up to 100 selected participants will receive an eight-week follow-on internship with an American nongovernmental organization or business. “We are very pleased to welcome these young African leaders to the University of Notre Dame under this U.S. Department of State flagship program, and we look forward to helping to train the next generation of business leaders in Africa,” said Mendoza College of Business Dean Roger Huang. At Notre Dame, the fellowship participants will be hosted by the Nonprofit Executive Program at Mendoza, which has a proven leadership record in ethics, corporate social responsibility, business for good and value-based leadership. The Ford Program has established strong relationships with universities in East Africa, and seeks to work with partners to build local capacity for solving the challenges associated with extreme poverty. The ESTEEM program combines science and technology with business expertise to encourage outside-the-box thought processes that lead to innovative ventures in a complex world. NDIGD unites the existing strengths of these programs with a dedicated staff of experienced international development professionals, administrators and researchers in the areas of training and capacity building, monitoring and evaluation, and policy analysis. The Washington Fellows’ U.S.-based training is only the beginning of a long-term investment in these young leaders. In Africa, YALI will provide ongoing opportunities for networking, professional development, seed funding for entrepreneurs and community service. Fellows will have access to enrichment seminars, local and regional networking events and an online platform for future collaborations. 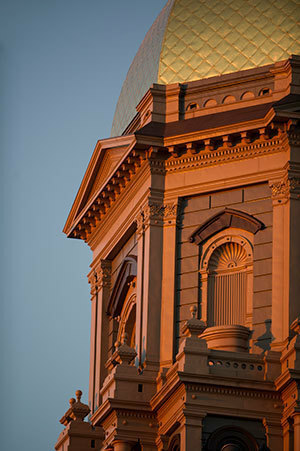 Originally published by Notre Dame News at news.nd.edu on February 27, 2014.